Fimbriated moray eels are seldom seen during daylight hours. Usually, they are hiding. Even more rare is a video of one swimming in its natural environment. During a dive in July 2015 a Fimbriated moray made a dash from one hiding place to another. This happened at Sand Castle dive site in Gorontalo. Many types of moray eels love this dive site. Usually, only their heads are visible. Their bodies are hidden inside holes and crevasses. Notice that the Fimbriated moray eel in this video swims with its mouth open. It does not feel threatened by the divers who were watching it. But what does that behavior indicate? 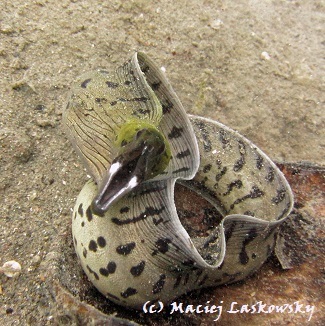 Like other eels, Fimbriated moray eels breathe by opening and closing their mouths. This helps pump oxygen-rich water through its gills. A small opening behind an eel’s head is where water exits the gills. Perhaps the eel in the video is out of breath from its unexpected daylight swim. A distinctive of all morays is the single, continuous fin. It begins behind the head, encircles the tail, and then reaches midway under the belly. Unlike snakes, morays lack scales. Instead, their muscular bodies are covered with a protective coating of mucous. The scientific name of this eel is Gymnothorax fimbriatus. Perhaps the finger-like patterns of black spots are the reason it was named fimbriated. Morays of the Gymnothorax genus have long, pointed teeth. They use these to catch fish and octopi to eat. In fact, if divers see an octopus with a missing arm, the culprit is probably a moray eel that attacked unsuccessfully. Moray eels typically hunt at night. Fimbriated moray eels are medium in size. They reach a maximum of 80 centimeters in length. One such eel living in an aquarium for 18 years has grown to 100 cm. The pattern of dark spots are distinctive of this species. However, since it rarely ventures from its hiding place, divers will rarely see that pattern. An easier way to identify this moray is to notice its tapered snout. Most importantly, the corners of its mouth are distinctively white. This moray eel is found throughout Indo-Pacific waters. It prefers coastal reef of oceanic islands but is also found in lagoons and harbors. It is only common in Bali. To glimpse one of Gorontalo’s moray eels, please book your dive trip with us.